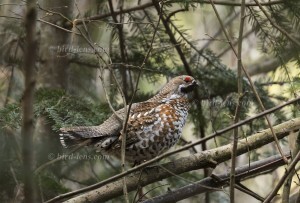 The hazel grouse was originally distributed mainly in the second and third zones of the hills and low mountain ranges. The drastic decline of the Western Hazel Grouse began in 1935, initially in the north and west of the reference area. Between 1964 and 1992, the species had already cleared 90% of the lowlands and 40-55% of the low mountain ranges. In 1976 there were still 260-330 pairs in the Vosges. In 2016 number declined to only 20-50 pairs. Between 1990 and 2000, 2,000-10,000 couples of the Western Hazel Grouse were estimated throughout France; most recently only 6,000-8,000 mainly in Jura and Alpes with the subspecies Tetrastes bonasia styriaca. There are several reasons for this decline, but the disappearance of thickets and the transformation of the once well-structured mixed forests of fir and beech in the Vosges into single-layered forests without substructure and internal structure are important. Other complicating causes include the significant increase in ungulates over the last 30 years. These include Wild Boars (Sus scrofa) and Red Deer (Cervus elaphus). The sustained negative effects of Wild Boar is probably due to nest predation. Actually, the Wild Boar did not occur historically due to the difficult climatic conditions in the higher altitudes of the Vosges. Its presence has been made possible there in the last decades by laid out churns. As far as the Red Deer is concerned, their effect could be indirect by eliminating the woody subphase of the Hazel Grouse’s popular light-dependent tree species. The situation of the species in the northeast of France is now extremely worrying. So far, no concrete measures have been taken in its favor, and until recently, no one was really aware of the seriousness of the situation, even among scientists. This loss would be all the more damaging as it would affect the last reasonably enduring population of the subspecies rhenana of the Hazel Grouse. The subspecies rhenana of the hazel grouse covers the westernmost distribution area of ​​this grouse occurring otherwise up to the Pacific. The birds that are found in the northeast of France and in the adjacent regions of Belgium, Luxembourg and south-west Germany differ considerably from their relatives living further to the east. To cope with the growing demand for top shots of the rarer species of the Palearctic Bird-Lens is keen to enrich the range of pictures of birds you can find in the western palearctic. Trips to remote places like this one to capture images not only of rare birds of western palearctic were very successful. The yield of pictures not only of rare Western Palaearctic birds is very good. Unfortunately, no picture of the subspecies described above could be made yet. 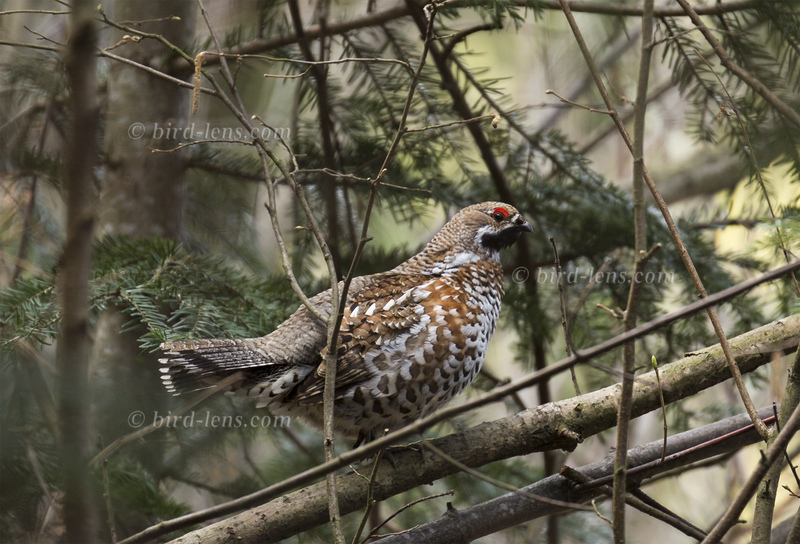 The male Hazel Grouse shown in the blog therefore belongs to the subspecies Tetrastes bonasia styriaca (or Bonasa bonasia styriaca), which occurs in the Alps at altitudes between 600 and 1,900 m asl and in the Carpathians between 600 and 2,950 m above sea level. The nice image of the blog is only a first impression, what you will find in the gallery in the “Picture Shop” very soon. Just give bird-lens.com a message, if bird-lens.com could serve you with an image needed before the new pictures are online.